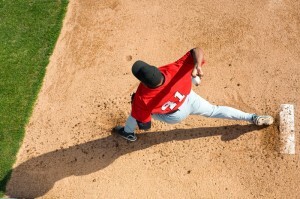 What are the Most Common Sports Injuries and Treatments? Running, jumping, swinging, pivoting, catching, throwing– Sports provide a diverse and exciting range of fun physical activities in our world. Practicing and participating safely is of course very important, as players always face the risk of injuries during their sports activity. Some sports may inherently carry a greater risk than other ones, given the different nature of their competitive feats and challenges. The sports with the greatest number of injuries include: Football, Basketball, Soccer, Baseball and Softball, Wrestling, Track and Field activities, as well as Gymnastics and Cheerleading. As a result of these, several of the most common sports injuries are: Ankle sprains, Shin splints, Knee injuries (including ACL and Meniscus tears), Hamstring and Quadriceps muscle strains, Elbows (tennis elbow), shoulder sprain or dislocation, and head concussions. Ankle Sprains are one of the most frequent sports injuries, being common to many sports. Ankle Sprains commonly result from inward or outward turning of the ankle as the connecting ligaments stretch too far. When this occurs, the ankle will be tender and painful to walk on. However, proper stretching and continued (gentle) movement are key for preserving your range of motion- because injured ligaments and tendons tend to retract following an injury. ng and weight-bearing, or the knee “giving out” with significant range of motion because it is no longer stable. The more significant the ACL tear, the greater your chance of requiring surgical repair of the ligament. Head Concussions are a common sports injury, most associated with direct and forceful contact to the head. Concussive symptoms may include headaches, nausea, vomiting, dizziness or difficulty maintaining your balance, or disorientation and in some cases, amnesia. Even after the time period immediately following an impact, these symptoms can persist as a “post-concussive syndrome” for up to several weeks. You can think of a concussion as sort of “stunned brain”. Abstaining from your associated sport or activity is absolutely essential, because your brain is in a critical period, and needs complete healing. Returning to activity too soon can pose great danger of what has been referred to as ‘Second-impact syndrome’, with a second concussion proving fatal on top of the first concussion that has not yet healed. od flow, minimizing risks of hyperextension, pulled muscles, and joint trauma. General treatment for all kinds of muscle, connective, and joint injuries broadly includes: Rest, Ice, elevation, and anti-inflammatory medications. Specialized physical treatment with a Chiropractor, including targeted physical therapy, may be very beneficial as well. If nonoperative treatment fails to work, Dr. Adam Farber at Phoenix Shoulder and Knee is the top sports medicine orthopedic surgeon in the Valley. He offers minimally invasive treatments for all types of tendon and ligament injuries, with most insurance being accepted. For top orthopedic treatment in Phoenix, Mesa, Scottsdale AZ call today!